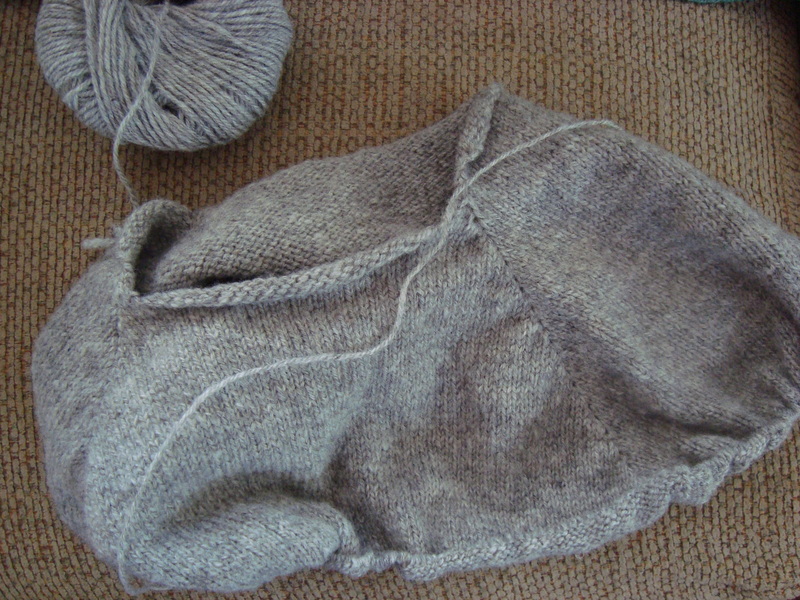 That’s the top of a raglan sweater, a little hard to see in its crunched-up on the needles state. This is the yarn spun from the Harriet fleece that I’m making for Mike’s sweater. I’m about half way to the sleeve split, I’d say. I ended up having to go down to size 2 needles to get the fabric I wanted, but the knitting is pretty fast anyway since it’s all stockinette. So fast, in fact, that I need to get some spinning done before I can continue. All of the Harriet fleece is spun already, but I’m a little short on yardage and so decided to make a wide band at the shoulders with some of the leftover MacGyver yarn from Branden’s sweater. 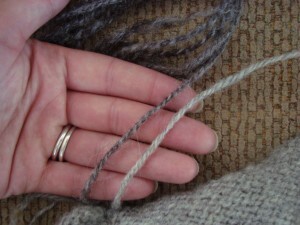 That was all fine and good, until I went and found the MacGyver yarn and realized that it was spun at a heavier weight. I thought that the two yarns were about the same, but never did any sampling to check because I wasn’t originally planning to put them together. When I looked at the two yarns, they are very clearly different. Comparing the gauge of the two sweaters, I am pretty sure I’d have distortion around the stripe if I were to use the MacGyver yarn directly. What to do? Well, it occurred to me after thinking about it for a while that I’ve never tried yarn reconstruction. I’ve heard of others splitting yarns up into individual plies and respinning or repurposing them, but it’s not yet in my bag of tricks. It then occurred to me that it should be. So, I unspun my three ply yarn by running it back through the wheel, and then wound the three plies onto separate bobbins. Then I took two of them and plied them back together, to make a yarn that really is very close to what I’m going for. I now have one skein of yarn unplied, and am working on winding those live singles onto separate bobbins. It was a lot easier in my 6-yard sample than it is for a whole skein, but it is slowly progressing. I’m thinking I’d better hurry up, or I’m not going to have knitting for my commute next week! My goodness!! I’m happy your experiment worked. I have never had to unspin yarn but you make it sound completely doable. Did you unspin a little, wind a little, etc? Oh wow, you really have a lot of work in this sweater! Good luck getting the skein replied for Monday. That Harriet yarn is crazy beautifully spun. It is worth the effort of MacGyvering the MacGyver yarn. Very nifty! 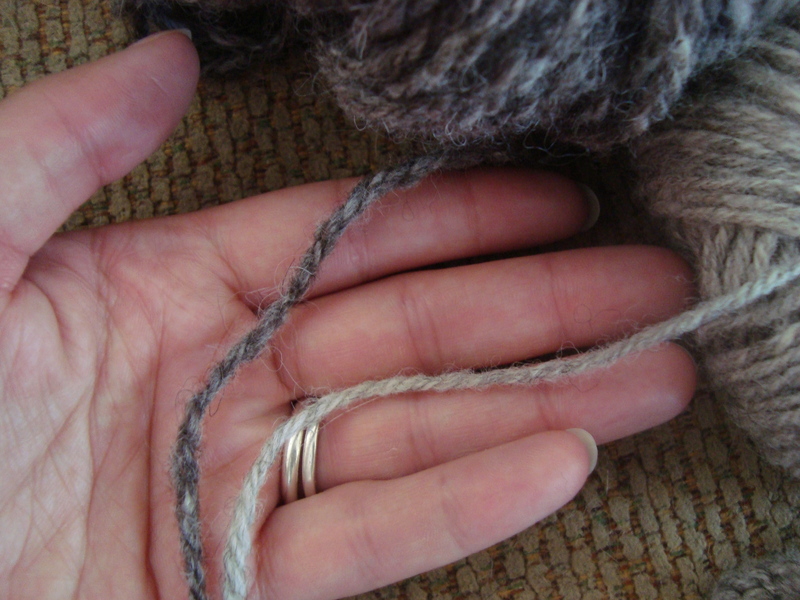 I have unplied things before, but never my own handspun. Good commute knitting. DesigKnit is powered by	WordPress 4.8.9 . Page generated in 0.283 seconds using 39 queries.